In preparation for Curiosity’s exploration of Mount Sharp on Mars, NASA engineers took a test rover out to the desert for last minute training in the sand dunes. Team members of NASA’s Mars Science Laboratory mission took a test rover to Dumont Dunes in California’s Mojave Desert this week to improve knowledge of the best way to operate a similar rover, Curiosity, currently flying to Mars for an August landing. 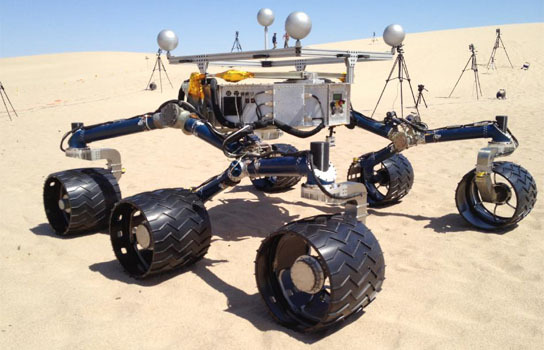 The test rover that they put through paces on various sandy slopes has a full-scale version of Curiosity’s mobility system, but it is otherwise stripped down so that it weighs about the same on Earth as Curiosity will weigh in the lesser gravity of Mars. Curiosity is on track for landing the evening of Aug. 5, 2012, PDT (early on Aug. 6, Universal Time and EDT) to begin a two-year prime mission. Researchers plan to use Curiosity to study layers in Gale Crater’s central mound, Mount Sharp. The mission will investigate whether the area has ever offered an environment favorable for microbial life. Be the first to comment on "NASA Prepares for Mars with Desert Rover Tests"